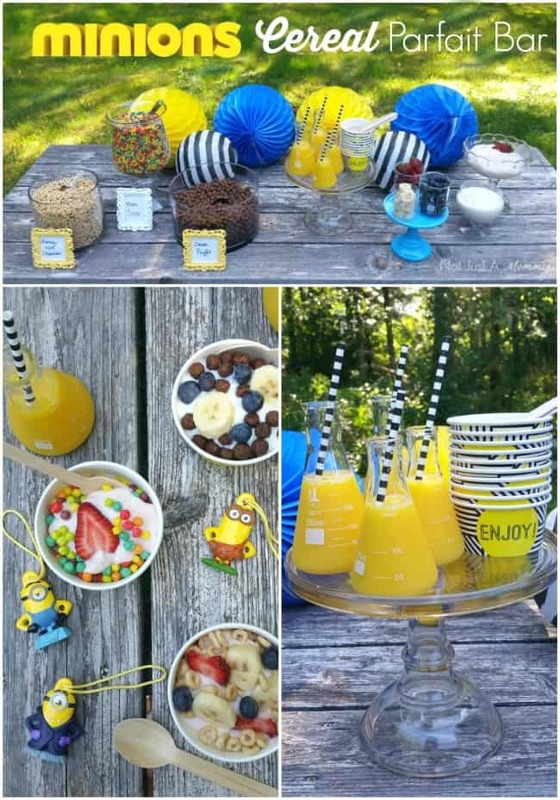 This Minions Party post is courtesy of our contributor Dawn…Are you excited for the July 10th release of Minions? We certainly are, so of course it is time to share lots of fun ways you can celebrate by sharing some of my favorite ideas on how to host a Minions party. It will be a hot theme on the party circuit this summer! Keep it simple and invite friends over for a Minion pre-movie watching event, making cereal parfaits! This is perfect if you are catching a matinee show; hop on over and check out some great tips that are easy on the wallet and require zero crafting. If you are thinking about a birthday party theme, perhaps an event before or after watching the movie, here are a variety of ideas for every level of crafter. Head to Betty Crocker and learn how to make these adorable Minion favor jars. Bakerella can rock a cute cake pop or two…follow her tutorial to make your own mini Minions. Tidbits & Twine used tape and printables to create these adorable Minion hats. Candy buffets will be around forever – I love this set up from Aisle Planner. I am currently obsessed with all things balloon arches since I created one for a major event and this version featured on Kara’s Party Ideas is a perfect way to greet guests. Ba-Ba-Ba-Ba-Ba-nana! Head over to Anders Ruff for another great party idea, a Banana Split Party, featuring Piggy Bank Parties’ banana favor boxes. Lemon and blueberry go hand in hand…these gorgeous cupcakes from Southern Boy Dishes fit in perfectly into your party’s color scheme. If cake pops are a little intimidating, try your hand at dipping Minion marshmallows with Cheeky Kitchen for Tablespoon. Keep it healthy with pineapple and blueberry cups from Wonderfully Made Events. Head over to Birthday Express for latex Minions balloons and yellow and blue decor and mylar balloons. How much crazy fun is this Banana and Oreo Ice Cream from Homemaking Hacks? Set up a Minion cookie making station with Love From The Oven as one of your party activities. Here’s another party activity option; make ahead Minion Munchie Snack Mix and set up a snack bag making station for guests to enjoy by Young At Heart Mommy. I hope you have been inspired to celebrate with your little minions…are you already party planning? We would love to hear what you are up to! 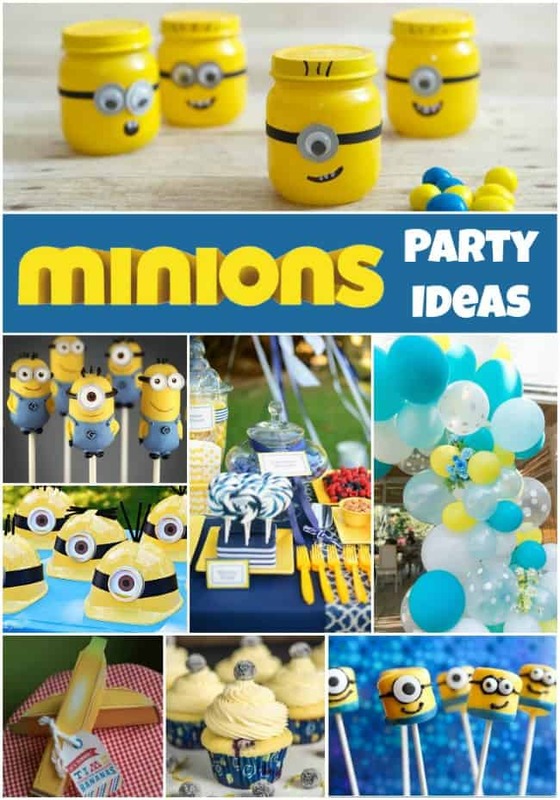 You’ll find even more Minion Party ideas in our special Minion section! 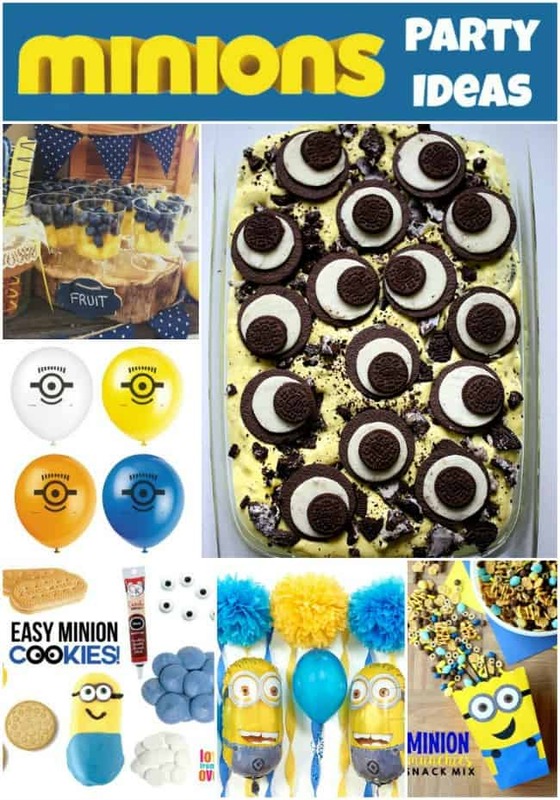 We’d like to send a big THANK YOU to Dawn of Not Just A Mommy for gathering and sharing all these creative Minion party ideas with us! Over on Dawn’s blog you’ll find plenty of party inspiration for all of life’s celebrations! Her party ideas are always bright, colorful and cheerful! Be sure to follow her on Facebook, Pinterest and Twitter for even more creative ideas.